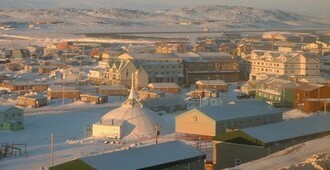 Visitors can experience many different and exciting activities on the Puvirnituq Snow Festival. Snow sculpture contests, traditional games and competitions are organized there on the occasion. A snow polar bear with the height of five-metres was made in 2007. The community centre offers music, dance and artistic performances every evening. Participants made a huge structure of a giant igloo together that was 40 metres around and five metres high. Approximately 400 people entered it at the same time.